The name suits the location. As we, the Midwest Winery Gals, entered Hidden Lake Winery we discovered a beautiful hidden treasure. There are signs if you’re coming off the interstate 64 or off of the Hwy 50 that help guide you to this oasis. It is also only about 30 miles from St. Louis. If you are visiting Carlyle Lake this is just a hop, skip, and jump away at about 15 miles in Aviston, IL. It’s far enough out into the country but not difficult to find. There’s plenty of parking for all the facilities. The two buildings on the left as you enter can be rented for special occasions, weddings, etc. As you enter the silent forest you come to the main building, winery, tasting room, & restaurant. Around the lake is another smaller facility to rent for events as well. 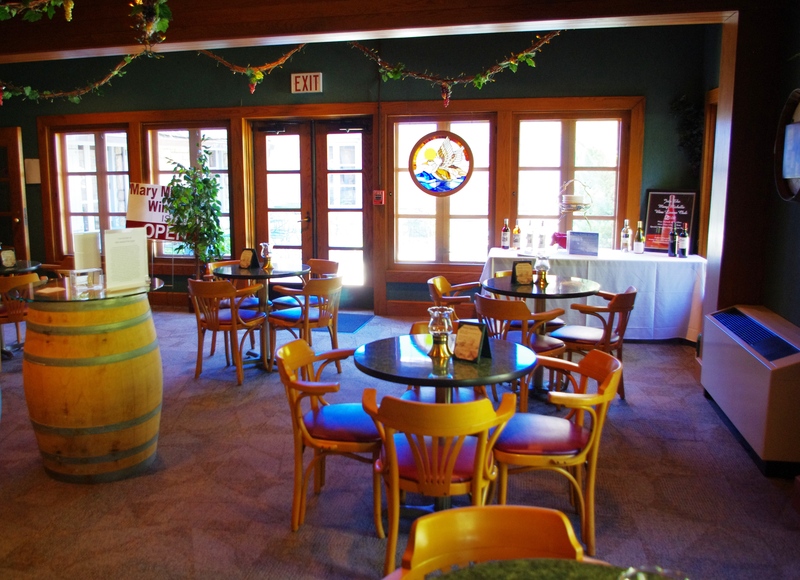 They can host a variety of events all on the same night due to the spacious layout of the winery. To help accommodate the event takers, or just the weekend getaways, they offer a variety of lodging in the eight forest cabins as well. They are well kept with jacuzzi and fireplaces so you are not roughing it at all. Ok the roughest part could be the walk from the winery to your cabin if you sample too many, otherwise it’s all very accessible. As we entered the restaurant and tasting room the staff greeted us. After the chef seated us…hmmm… he made some recommendations for our evening dinner. Our waitress was very friendly. The owner Angie stopped to say hello and ask how things were which was very nice I thought. On our way out of the restaurant we passed the winemaker and he asked how things were. I felt they are passionate about what they are doing and want to make sure the customers are satisfied as well. As far as appetizers they offered toasted ravioli, wings, fried onions, spinach artichoke dip and our choice was the gourmet cheese, fruit, and sausage platter which featured hearty locally produced cheeses the menu stated. 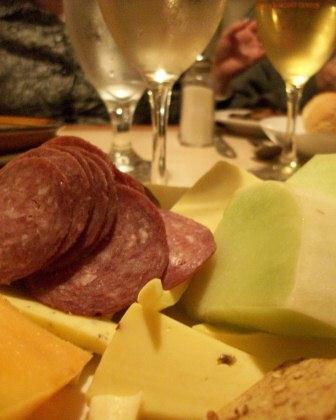 Our platter had melons, cheese, crackers and sausage on it in a nice display spread. The appetizers varied in prices from $3.99-$9.99. If you’re out for something light you can pick a salad or eat off the kids menu. They offered approximately eight main entrees and pastas. My selection was the sirloin because I’m a meat and potatoes type of girl. It took up the entire oval shaped plate and was juicy and seasoned just right and served on a bed of tobasco onions. Did I mention it was 12 oz? Of course I had to take some home. My meal was $21.95 and I was able to eat for 2 days! I also have expensive taste so this was the most expensive thing on the menu where most entrees and pastas ranged from $13-$18.00. I felt I got my money’s worth and there was no room for dessert. There is a trail that you can walk around the lake if you feel the need to stroll the woods. 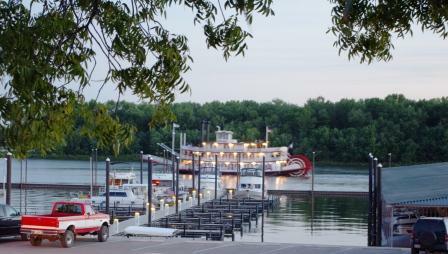 On a nice evening you can enjoy your wine on the large water side patio where they often have music and food available out there as well. For those cold, nasty, Midwest, winter days they have indoor seating and room for music, dancing, and more. We enjoyed the music which was performed by Roland Kreke a local talented musician who played a wide variety of music from early country to classic rock which was performed indoors on the upper balcony above the wine tasting bar. The atmosphere, people, wine, and entertainment made for a great evening. I do like to mention that they have very nice and accessible restrooms which are very important if you’re spending the evening enjoying the facilities. There’s so much to sit and enjoy at this winery so no matter what the occasion or season I recommend you check this place out! Chrissy’s Crushes: The warm, friendly, and inviting atmosphere! I spoke in depth with the winemaker, Nick who is a nephew of the owner, about the wines. He is very passionate about grape growing and winemaking. As a young winemaker he is doing everything he can to learn about the whole process of winemaking. He has evolved since I was there about 5 or 6 years ago. He was in high school then! Now, he is a businessman, winemaker, and grape grower who wants to achieve his fullest potential. I wish him the best. Tastings are free at Hidden Lake. There is a deposit on the glass but you get that back when you return it. Traminette – Labeled as My Best Little Pick-up Wine $13.95 btl. It has won three different awards: By the 2007 Il. Wine Competition – Bronze; 2008 San Francisco Chronicle Wine Competition – Bronze; 2012 Napa NexGen Wine Competition – Silver. This white wine is a semi-sweet with apple flavors and a floral bouquet. Riesling – Labeled as Hope Riesling $14.00 btl. This is a sweet white that had a fruity bouquet of pear. This wine would be a nice compliment with a wide variety of foods. 2012 Seyval Blanc – $14.50 btl. – dry white with grapes grown in this immediate area had wonderful aromas of citrus and grapefruit, light bodied, very smooth with a nice lingering finish. They are most proud of their Seyval Blanc. I agree this is the best Seyval that I have tried so far. They offered many others but one in particular I noticed was their Double Decker Red. It was a blend of Catawba and Fredonia. I was told by a different local winery that the Fredonia isn’t grown around here too much but apparently it is being picked up by more Midwest wineries. Double Decker is a semi-sweet red with hints of raspberry and cherry and has won numerous awards as well- a bronze, silver, and gold. It is a pretty popular wine at this winery. Many other wines are on their menu like a drier Rocky Ford Red, Silent Forest Reserve, and a Marry Me Merlot. In the semi-sweets they have a Blush Zinfandel (Carpe Diem) and Kiss My Gi-zen-hime which is a Chancellor/Riesling blend and won two awards – bronze and a gold. Not a dry drinker? How about a sweet – Kaskaskia Concord otherwise known as Bucks Gone Wild, Old Hippie which is a Pink Catawba, a Spiced Applenamed Adam’s Apple after the owners son, and finally a Strawberry. 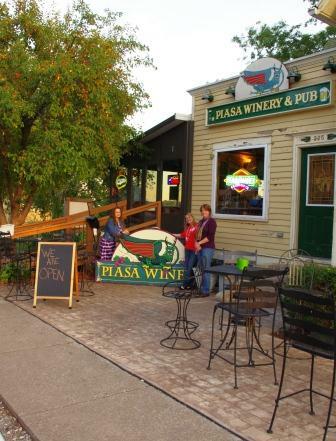 All their wines run between $12.95 and $16.00. Since we were there during October they were offering many different beers as well like Breese’s newest microbrewery beer – Excel Golden Brew, Schlafly Pale Ale & Heffewizen, three Boulevard Beers, O’Fallon Pumpkin, a couple Oktoberfest’s, Smithwicks, Warsteiner, and more. Lynn’s Wins: Of course the Seyval Blanc was my win because it had great flavor and because the grapes are totally grown in the local area. We had the opportunity to visit the Fall Festival at Maeystown, IL which is a quaint, little, historic village of about 400 people built near the bluffs of the Mississippi River. It was founded in 1852 by German immigrants and still has about 60 significant structures that still exist including the original church, a stone bridge, and Zeitinger’s Mill. It looks like the settlers just carved the stone out of the bluff to create their shelters. I was told that they use to have an event each month but have narrowed it down to three bigger festivals a year. We had the pleasure of attending the Oktoberfest which is always held the second Sunday in October from 9:00am – 5pm. 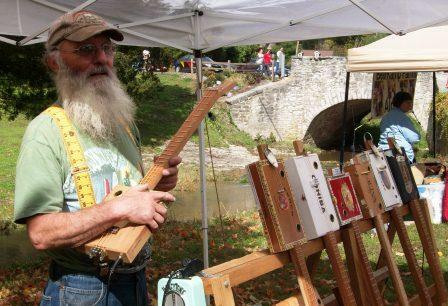 People actually open up their back yard to vendors of art, crafts, and antiques. They are all set up along a stream and the cool air and beautiful fall colors of the 200 year old (plus) trees made for a very enjoyable day. They certainly were not lacking on the food options. All the organizations in town provided different treats like homemade pie! It was a wonderful experience. The other two larger events are: The Old Fashioned German Christmas which is held the first Sunday in December which includes music, carriage rides, shopping, and more and The Springfest/Fruehlingsfest is the first Sunday of May with an antique and garden show. See how the town springs into bloom. Believe it or not, there is lodging in this small town: Corner George Inn Bed & Breakfast which is a restored 1884 hotel and saloon. There is also a coffee house, restaurant, sweet shoppe, general store, mill and museum all in this little town! 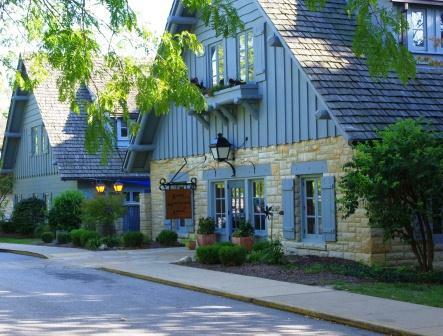 A short trip to Schorr Lake Winery, Lau Nae Winery, and Maeystown for their festival is the perfect little getaway for a couple looking for something fun to do. Chrissy added that there was lack of parking spaces which was mostly along the sides of the streets and that you may have to climb the steep roads so wear your walking shoes. 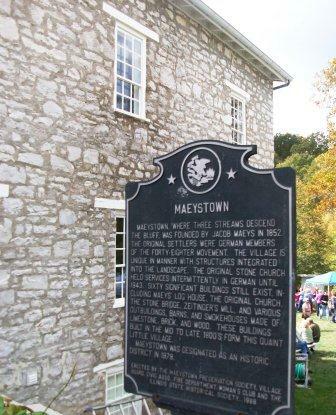 Chrissy’s Crushes about Maeystown was the old buildings and scenic setting. 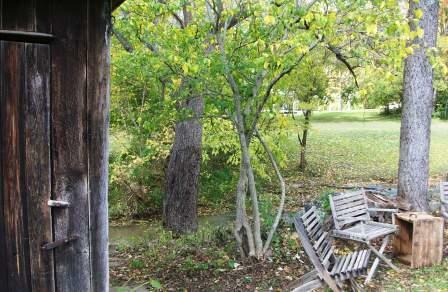 Lynn’s Wins was the beautiful brook and old bridge beside the festival. Driving in Southern Illinois when the fall colors are changing is absolutely breathtaking. Good therapy all on its own, so if you add a stop at a winery that just enhances the wonderful relaxing experience. Lau Nae was easy to find since it was on the main road, Illinois Rt. 3. Even though it sits right off the road it’s far enough from the town that it lets you enjoy the country like setting with a modern touch. The staff was nice. One girl seemed to be new and kept asking the other one who seemed overwhelmed. They were taking food orders, doing wine tastings and getting drink orders and it was a Saturday. You order your food, place wine/drink orders and do tastings all at the same bar. You get a pager so when you’re foods done you go back to the bar to pick it up. This is nice because you can sit anywhere and enjoy your food and wine. We chose the patio next to the bon fire and grape vines. As we were leaving we were greeted and thanked by the winery owner who was nice and grateful for our business. From appetizers, pizza, salads, to BBQ they have it all. Appetizers varied from Baked Roasted Herb Bread to dips, cheese platters and more. Lynn chose the sausage and cheese platter which had a nice selection of cheeses, fruits, olives, breads and salami slices for $12.00. I indulged in the BBQ pork sandwich with sweet and sour sauce and my 2 sides of (mayo based)cole slaw and beans YUM. The pork was tender and seasoned just right all for only $9.00. There was so much I could only eat half of it all. So go hungary and thirsty they can fulfill the hunger! As you enter the winery it’s lined with grapevines which you are encouraged to sample the grapes, so of course we did and I loved it! Lau Nae could host a few events at a time with two indoor banquet areas besides the tasting room with additional seating, the front porch and patio with fire pits. It is a great place to hold a small wedding, party, or social gathering. They offer special catering packages, party, wedding, and or reception packages. They can also customize a wine label for any special occasion. The entire place seemed to have been updated recently and was very warm and inviting no matter where you chose to enjoy the day or evening. Chrissy’s Crushes: The grapevines that you could sample right off of. YUM! Lau Nae was established in 1999 and was the 17th winery in the State of Illinois. It was handed down to Matt Mollett by his parents in 2007. They grow many of the grapes themselves – Chardonel, Niagra, Concord, Chambourcin, Marechal Foch, Catawba… They had many wines that they offered but only certain ones could be tasted so depending on when you visit Lau Nae Winery you might be able to taste different wines. You did have the option to purchase any bottle they offered and consume it there. My understanding is that they have a wine club and the winemaker is always looking at blending juices and trying to create new wines like for example, “The Octopus”. I think he was running out of names!!! As Chrissy said we sat on the patio next to the grapevines and of course we had to try them. They were Concord grapes and I couldn’t stop eating them. The darker purple ones were tart and the reddish ones were sweeter and they each had different amount of seeds in them. Overall the prices were good and the food was very good. Sauvignon Blanc – $14 a bottle, was light, crisp, refreshing, medium finish. Very good. I enjoyed this one but had better. Seyval Blanc/Riesling – $13.50 a bottle, white that smelled like bubble gum! Yummy. Cabernet Franc – ruby colored, peppery, spicy, black currants, tannic, long finish. It was a little spicy and tannic for me but others would certainly enjoy it. Pride – $14.75 a bottle, blend of Chambourcin, Syrah, Dolcetto, very well balanced, lighter, medium finish 13.5% alcohol. This is the one I enjoyed the most and got a bottle of to take home. Geisenheim -$13.50 btl. – a semi-sweet white, crisp, citrus tasting wine from the Foch grape. Traminette – $13.50 btl. -which I’m a fan of anyway- a semi sweet white. Lynn’s Wins: The Pride – it was lighter and very nicely balanced. This is the glass I chose for the evening. Red Bud is about 40 miles from St. Louis. The Getaway Gals decided to stay nearby after trying wine. Smart move because we could enjoy ourselves a little more. The stay at Red Bud Country Suites was excellent. The cost was about $76 with tax for a king size bed suite. Not bad. The room was very clean and comfortable. They even had a frig and microwave in the room. It stormed that evening but I didn’t hardly hear anything and slept like a baby! Chrissy wanted to add that the owner, Ray, was very accommodating when she said we would be checking in late. The next morning he called one of our rooms to make sure we got the continental breakfast and he was helpful to point out some local places to dine. She felt the place was clean and safe. We would stay there again without a doubt.